Rudy Giuliani's Son Loses The Case Of "Duke vs. Spackler"
Andrew Giuliani used to play golf at Duke University until the coach that recruited him died, and the new coach realized that he was a terrible golfer. Andy sued after being booted from the team and the judge made him look stupid by quoting Caddyshack as he dismissed the case. Giuliani—America's Mayor's Son—lost a summary judgment in his breach of contract case after the judge determined there was no actual contract made. (He was not on scholarship and even if he was, they can be revoked.) However, Magistrate Judge Wallace W. Dixon found the whole matter so amusing, that he decided to sprinkle his opinion with golf terminology ("Plaintiff attempts to take a mulligan, but this shot goes into the drink.") and even a line from a terribly overrated golf comedy. "Plaintiff's promissory estoppel claim which was not argued in his brief, brings to mind Carl Spackler's analysis from the movie CADDYSHACK. 'He's on the final hole. 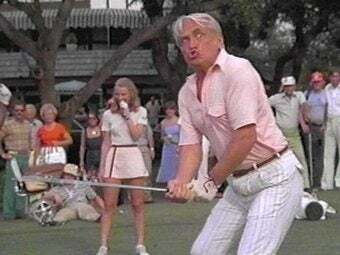 He's about 455 yards away, he's gonna hit a 2 iron I think.' North Carolina does not recognize affirmative claims of promissory estoppel." HA HA! Estoppel! I get it! Wait ... no, I don't.